A love story in times of space travel. 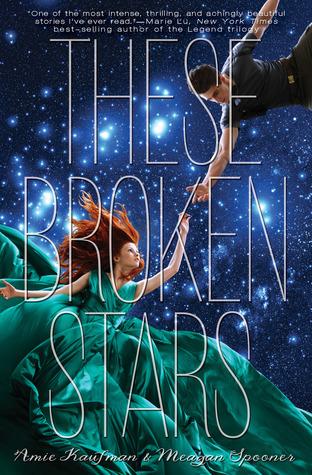 Presenting Starbound #1 These Broken Stars by Amie Kaufman & Megan Spooner. A tale of the space age. This is sci-fi, with a big survival focus in there, and a big classic romance with the dazzling and eye-catching cover setting things off perfectly. Literally.... Jaw-droppingly swoonworthy..... A gripping and recommended debut to the Starbound series. One of the major points to this story is the gradual character development that takes place throughout the book. You see them squabbling for control, be wary of each other, but slowly coming to an understanding, a shared load of pooled talent needed to comb the planet and hope for rescue. And that planet sure has its share of mysteries too, the strange inhabitants of the planet. "A captivating and enticing sci-fi survival tale helped together be the love story of the millenia"
I am glad you loved this one and thought it was amazing. I think the cover is fabulous and have it on my list to read. Thanks for sharing! I read this one and liked it too. At first, I had trouble liking Lilac's character, but as the story progressed, I began to like her..as you said, good gradual character development.. I can't wait to read the next one in the series.